For decades, the balance of power among the world’s strongest nations was the dominant issue in discussions of global security. Many of today’s policies and international institutions were specifically created to deal with potential violent conflict between major powers. But today, the world’s most fragile states are emerging as the most serious threat to 21st-century global security. Fragile states aren’t failed states. They are countries that straddle the thin line between survival and chaos, suffering from weak governing infrastructures, internal conflict, ethnic tensions, or economic despair—and sometimes from all of the above. Though largely overlooked, the global consequences we all face from the growing number of fragile states are both immediate and real. Their weaknesses often permit extremist groups to thrive within their borders. Beyond the threat of terrorism, fragile states can become breeding grounds for disease pandemics, create waves of regionally destabilizing mass migration, or offer safe haven for drug, arms, and even human traffickers. 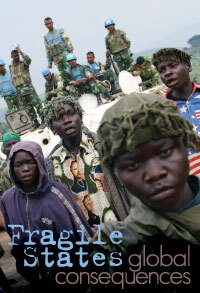 Now Showing Fragile States, Global Consequences features a DVD that helps viewers examine the global challenge of fragile states. It encourages discussion of a growing movement in the international community to find comprehensive ways to promote stronger nations and more effective ways to deal with those already on the brink of failure. "Courier: Why Fragile States Matter"—a publication produced by the Stanley Foundation that includes articles on how smarter aid could end conflict, sustainable security and fragile states, and the international effort to restore peace in Kenya after post-election violence. "Courier: Is Human Protection A Priority? "—a publication produced by the Stanley Foundation that includes articles on international inaction in ethnic violence in Kyrgyzstan, the UN's peacebuilding efforts, and international interventions in four countries in crisis. "Forging a US Strategy for Fragile States"—a policy memo from the Stanley Foundation. "Stabilizing States in Crisis: Leveraging International Capacity"—a policy memo from the Stanley Foundation. "Implementing the Responsibility to Protect"—a conference report from the Stanley Foundation, includes remarks from UN Secretary-General Ban Ki-Moon. "The Challenges of State Fragility for US and Global Security in an Interdependent World"—a conference report from the Stanley Foundation. "The United Nations and the Responsibility to Protect"—a policy analysis brief from the Stanley Foundation by Edward C. Luck, Senior Vice President and Director of Studies at the International Peace Institute and Special Adviser to the UN Secretary-General at the Assistant Secretary-General level, in which capacity he primarily focuses on the Responsibility to Protect. Failed States Index: An annual collaboration between Foreign Policy magazine and the Fund for Peace, the index draws on publicly available sources to analyze countries and rate them on 12 metrics of state decay. A country's performance on this battery of indicators tells how stable, or unstable, it is. International Coalition for the Responsibility to Protect: The International Coalition for the Responsibility to Protect brings together nongovernmental organizations (NGOs) from all regions of the world to strengthen normative consensus for Responsibility to Protect (R2P); further the understanding of the norm; push for strengthened capacities to prevent and halt genocide, war crimes, ethnic cleansing, and crimes against humanity; and mobilize NGOs to push for action to save lives in R2P country-specific situations. International Crisis Group: The International Crisis Group is an independent, nonprofit, nongovernmental organization committed to preventing and resolving deadly conflict. They cover more than 60 conflict and potential conflict situations worldwide, produce reports and briefings on those conflict situations annually, and publish a monthly CrisisWatch bulletin. Pulitzer Center on Crisis Reporting’s Fragile States Project: An interactive, educational Web portal that helps tell the stories of the dangers weak states around the world pose, and also the international interventions that appear to be making a difference. Pulitzer Center on Crisis Reporting’s Peacebuilding Project: Jina Moore, a freelance multimedia journalist and a regular correspondent for the Christian Science Monitor, reports on peacebuilding projects in Guinea Bissau, Burundi, Sierra Leone, and Central African Republic. The Stanley Foundation: As a part of its work to promote public understanding, constructive dialogue, and cooperative action on critical international issues, the Stanley Foundation believes the need for effective human protection remains a central peace and justice priority. The world's weakest and most fragile states pose shared global security challenges. Resources include policy analysis, articles, and media.